Home is beautiful and comfortable. It's in a gorgeous location that is just a few minute walk from the Brighton slopes. Highly recommend. 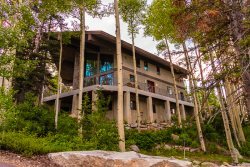 Fantastic property close to Brighton Ski Resort. communication was quick, information on area was provided. We had a wonderful time and certainly would rent again. Our stay at the "Great West" home was wonderful. The house was really clean, the kitchen had most of the needed items to feed our family for the week, and the beds and linens were nice as well. The view was spectacular! The ski in ski out was good for most average skiiers. It is a bit of a walk to the main lodge in your ski boots if you don't take the Great West lift! We plan to go back in 2 years.